Indonesia is the key revenue generating country in South-East Asia's diesel genset market. Led by factors such as expanding infrastructures, power demand-supply gap, increasing telecom infrastructure, rising residential societies and intensifying industrial base, the market for diesel gensets in Indonesia is expected to surge in the coming years. According to 6Wresearch, Indonesia diesel genset market is projected to grow at a CAGR of 6.7% during 2016-22. In Indonesia, diesel gensets with rating 5KVA-75KVA have captured key share of the market owing to wide adoption across various verticals. Telecommunication, residential and SMEs are the prime consumers of these gensets. Amongst all verticals, commercial vertical accounts for major share of pie in overall Indonesia diesel genset market, where, telecommunication, IT/ITeS, data centers, small businesses and commercial centers are the key revenue contributing sub-segments. The report thoroughly covers the market by KVA rating, verticals, applications and regions. The report provides the unbiased and detailed analysis of the on-going trends, opportunities/high growth areas, market drivers which would help the stakeholders to device and align their market strategies according to the current and future market dynamics. • Historical Data of Global Diesel Genset Market Revenue for the Period 2010-2015. •	Market Size & Forecast of Global Diesel Genset Market Revenue until 2022. •	Historical Data of Global Diesel Genset Market Volume for the Period 2010-2015. •	Market Size & Forecast of Global Diesel Genset Market Volume until 2022. •	Historical Data of Indonesia Diesel Genset Market Revenue by KVA Rating for the Period 2010-2015. •	Market Size & Forecast of Indonesia Diesel Genset Market Revenue by KVA Rating until 2022. •	Historical Data of Indonesia Diesel Genset Market Volume by KVA Rating for the Period 2010-2015. •	Market Size & Forecast of Indonesia Diesel Genset Market Volume by KVA Rating until 2022. •	Historical Data of Indonesia Diesel Genset Market Revenue by Vertical for the Period 2010-2015. •	Market Size & Forecast of Indonesia Diesel Genset Market Revenue by Vertical until 2022. •	Historical Data of Indonesia Diesel Genset Market Revenue by Application for the Period 2010-2015. •	Market Size & Forecast of Indonesia Diesel Genset Market Revenue by Application until 2022. •	Historical Data of Indonesia Diesel Genset Market Revenue by KVA Ratings by Vertical for the Period 2010-2015. •	Market Size & Forecast of Indonesia Diesel Genset Market Revenue by KVA Ratings by Vertical until 2022. •	Historical Data of Indonesia Diesel genset Market Revenue by Regions for the Period 2010-2015. 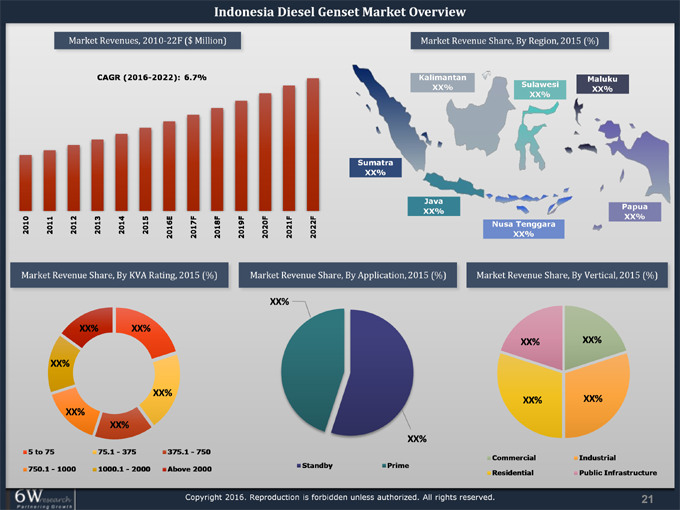 •	Market Size & Forecast of Indonesia Diesel Genset Market Revenue by Regions until 2022. •	Market Trends and Developments. •	Diesel Gensets Price Trend. •	Major Players Market Share. Indonesia diesel genset market is forecast to exhibit steady growth on account of widening demand-supply gap of power, unreliable grid infrastructure and growth in industrialization and commercialization. Java and Sumatra are the key revenue generating regions in Indonesia diesel genset market. 5-75 KVA rating diesel gensets accounted for major revenue share in overall diesel genset market owing to extensive usage of these gensets across residential, retail, hospitality and telecommunication sector. Commercial vertical holds the largest share in Indonesia diesel genset market due to high demand for standby power in telecommunication, IT/ITeS, commercial centers, small businesses, banks, hotels, and educational institutes. The major companies in Indonesia diesel genset market include- Caterpillar, Deutz, Perkins, Yanmar, MTU, Cummins, PT. Dein Prima and others.